The Master of Urban and Regional Planning (MURP) is part of the Toulan School of Urban Studies and Planning, where we believe that planning practice addresses our common future in order to make places better—more just, sustainable, and prosperous. Our own planning practice advances inclusive participation in planning institutions and recognizes a diversity of needs and aspirations in communities. Ranked in the top 25 by Planetizen, our program enables students to be reflective, build practical judgment and adaptive problem‐solving skills through direct engagement with contemporary planning issues and practice. PSU’s motto is “Let Knowledge Serve the City.” We take that seriously. 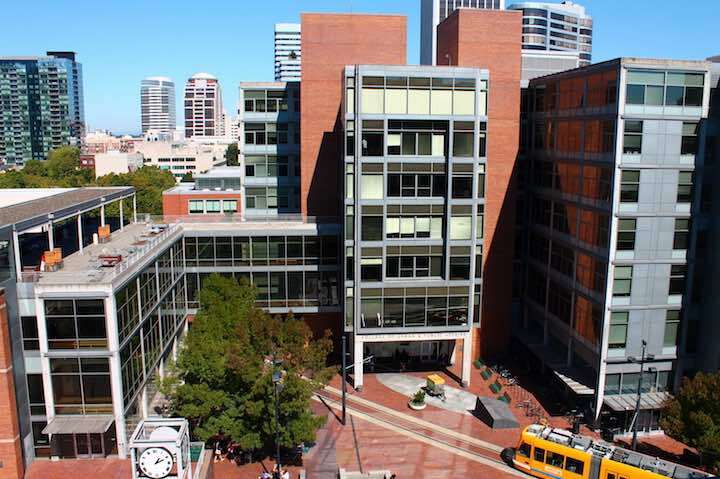 Our “classroom” extends beyond the walls of Portland State’s downtown campus. We bring planning practice into the classroom and we send our students out into the city to learn. Our faculty are directly involved in planning and policy in Portland and beyond. Learn more. Our students do award-winning projects that have tangible impacts. Experiential learning is an integral component of the program, which requires an internship and a workshop project that is client‐focused, community‐based and culminates in professional products that win awards, get implemented and have positive impacts on communities. Learn more. Our faculty are engaged in research that makes a difference. In addition to teaching, our faculty are engaged in scholarship addressing a wide range of issues: gentrification and displacement, urban heat islands, bicycling, urban agriculture, food justice, homelessness, the maker economy, accessory dwelling units, carbon taxes, equity planning, autonomous vehicles, disaster recovery, and collaborative planning processes. And their research is being used to change practice. Learn more. Planning matters in Portland, but we also connect with the world. Portland is often regarded as a “capital of good planning” in the U.S. MURP students have a front row seat to innovative planning efforts going on in the community through professional engagement, engaged student learning and faculty scholarship. But we’re not just about Portland. Our work and our impact goes beyond the urban growth boundary, throughout the US and to other countries. Learn more. We believe that planning practice can make places more just and equitable. We promote equity and foster an environment of cultural difference and diversity among faculty and students. These principles are fundamental to developing healthy communities and achieving academic excellence. Our commitment to diversity and equity can be found in our curriculum and research. Learn more. There’s more than just the MURP program. Portland State offers many opportunities to expand your knowledge and experience beyond the MURP program, including graduate certificates, dual degree programs, and engaged research centers. Learn more. Our graduates go on to do great things. Our MURP graduates go on to great careers, from ensuring equity in Portland’s Bureau of Planning and Sustainability to zoning and open space in Butte, MT. From directing Portland’s Streetcar to ensuring safe bicycling and walking in Seattle. From fostering economic development in Lancaster, PA to planning for growth in Hillsboro, OR. Learn more.